The Big Idea: Sharing and working together take practice and some problem-solving skills. 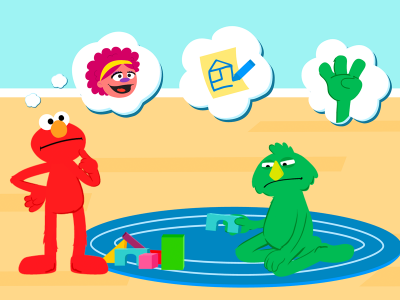 What would you do in Elmo’s situation? Can you think of another way to solve the problem here? Have you ever had this problem? How did you try to solve it? Do you like to ____ (play dress up, build with blocks, and so on, according to what’s on screen)?